To get an answer to that question, I guess readers of these essays will have to wait and see. Come to think of it, so will I.
November was frantic and December was chaotic and January so far has been…What’s a good word?….Ominous? Apocalyptic? Nostradamussy? Did I just invent a new word? The economy collapsing all around us…layoffs and a just-announced one-week furlough without pay at my own job…probably a big friggin’ meteor heading toward us from behind the blinding sun…wars and rumors of war…icebergs melting…Old Faithful no longer so faithful…publishing world still hasn’t recognized its obligation to publish “Half Moon” and “Gloryville” and “The Dogs of Arroyo” by Nicholas DiGiovanni… it’s like Dylan sang back in the 1990s because he knew this was all gonna come down like a hard rain a-faillin’…ain’t no use jivin’…ain’t no use jokin’…everything is broken. So that may explain why, much to my surprise and chagrin, I’ve paid only about a half-dozen visits to my very own World of Wonders in the last two months. But now that’s going to change. Poets Joe Weil, Maria Gillan and Rita Dove. Dylan expert Michael Gray. My latest quests for arts-colony invitations and arts-foundation money (and why is it that I just now realized the similarity between “arts colony” and “ant colony). Ray Bradbury. Niagara Falls. The future of newspapers. Puerto Rico. Louise Gluck and her recent great poem in the New Yorker. Extremely cold weather. New Year’s Eve in Vermont and a January 1st visit to the Weston Priory. A commentary on Thomas Merton’s relationship with his lady friend. More about my much-missed friend Robert Lax. More reasons why I want someone to offer me a job in Vermont. An account of a dinner conversation in which I explained to my wife why I didn’t go to Harvard or Princeton. Musings (I’m being inspired by the Muse) on the nature and meaning of true friendship. A long overdue report on a bunch of fine writers I got to meet at the Delaware Valley Poetry Festival this past October. Some (I hope) catholic commentary about the Catholic Worker movement. Some talk about books I’ve read recently. Some thoughts on recent and upcoming books by writer pals Steven Hart. Christian Bauman and Bathsheba Monk. Further explanation of why I’d like to live forever, even if that meant outliving all of my friends and family. Thoughts on whether I really do remember being in my mother’s womb. Thoughts on whether my late father and other dead people I once loved really do speak to me in my dreams. And, most important, of all, my thoughts on the Yankees’ acquisition of CC Sabathia and Mark Teixeira and A.J. Burnett. And much, much more! So stay tuned! 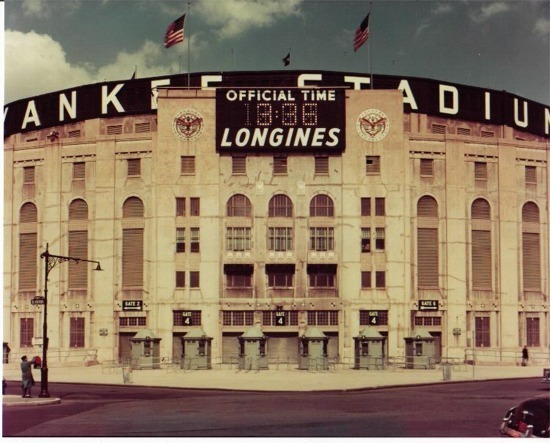 Some sports channel was playing the sappy Sinatra rendition of “There Used To Be A Ballpark” by Joe Raposo (which I’m assuming was actually about Ebbets Field) last night over a montage of photos and videos of historic scenes at Yankee stadium — Lou Gehrig, Babe Ruth, Roger Maris, Thurman, the Mick…so many great Yankees, making one more trip around and along the freshly chalked basepaths of memory and time. Silly song, but the title will soon also apply to the soon-to-be-no-more Yankee Stadium. I was at the big ballpark in the Bronx last week, less than a week before the final game. We sat just a few rows behind the Yankees dugout, midway between home plate and first base. During a rain delay, I peered out from under a plastic tarp and watched the ghosts as they slid into bases, made sure they touched the plate when they scored, leaped into the stands in pursuit of fly balls, tossed their masks, threw high and tight, signaled to the bullpen, lost the ball in the lights, smacked Ballantine Blasts into the upper deck and tipped their hats to the crowd. Growing up in Yonkers, just north of the Bronx, I’d take a bus to the Woodlawn subway station, catch the 4 train to 161st Street and sit in the upper deck — when I was a boy, the games were rarely sold out, and it was possible to go up to the ticket window just before the game and get at a seat in the third tier of the grandstands or in the bleachers, the only seats I could afford. My father was a Yankees fan — he had to be, as a second-generation son of Italian immigrants growing up in the New York City area in the 1940s and early 1950s in the era of Joltin’ Joe DiMaggio. 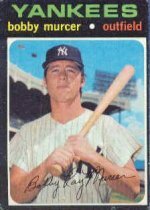 And while my father and I fought and differed and argued and never really reached a meeting of the minds before he died — we always agreed that the New York Yankees were our team. So about ten years or so ago I managed to get hold of a baseball signed by DiMaggio. I gave it to my father as a Christmas gift. Before he died, my ailing father clearly stated that he wanted his grandson — my son Matt — to have the Joe DiMaggio ball. Why? Well, my father doted on his first grandson. And my father also knew this story. It was Opening Day of 1996 and it was snowing. Little Matthew was 7 years old. He and I sat behind home plate, just under the overhang, wind and snow blowing directly in from centerfield. We were bundled up but still freezing. I don’t remember now who the Yankees played on that Opening Day and I don’t remember if they won or lost the game, that first game of their first World Championship year under new manager Joe Torre and with their hotshot rookie shortstop Derek Jeter. You’re going to remember this because it’s your first baseball game, and it’s Opening Day, and it’s your first trip to Yankee Stadium, and you’re here with me in the middle of snowstorm. But most of all I think you’re going to remember that man standing out on the mound about to throw out the first pitch? You know who that is? That’s Joe DiMaggio! More than ten years later, my son still has that ball signed by DiMaggio and still remembers that Opening Day and that conversation, and that’s one reason why I got teary eyed when Bernie Williams finally returned to the Stadium for last night’s final game; when Derek Jeter gave a surprisingly eloquent and apparently off-the-cuff speech to the fans after the game, then led his teammates on a farewell lap around the field, and when PA announcer Bob Shepard’s rumbling “Ladies and gentlemen….” echoed around the grand old ballpark one last time.